When it comes to architectural or structural design of wood buildings, there are only a few software packages available in North America (compared to what is out there for steel or concrete design). While these (e.g. cadwork, Dietrich’s, IES VisualDesign and more here and here) have great tools to design and size anything from a traditional wood-frame structure to a modern shell or a prefabricated system, the limited number of available software and also the lack of an integrated software for common structural or architectural planning packages (e.g. 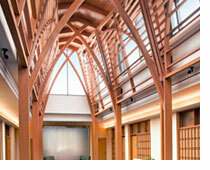 Revit) in my opinion puts a damper on widespread use of wood in large-scale non-residential projects. In simple terms: If a structural option can’t get checked in wood, then it doesn’t get spec’d in wood. Once the RISA software is updated, it will incorporate information on building code requirements, gravity design, diaphragm modeling and design, shear wall modeling, analysis and design, lateral force design, hybrid design and several other features. The upgrade will be Building Information Modeling (BIM) compatible and will be released in two stages throughout 2008. The first software release, set to occur in August, will incorporate flexible shear wall and diaphragm design without openings. The second release, slated for December, will allow the design of complete wood structures. This set of add-ons to Revit Architecture and Revit Structure by a company from Lithuania creates a rafter layout for roofs defined in Revit. Upcoming releases are slated to include connections and shop drawings as well. This is a great first step to enabling Revit to do wood design. I am looking forward to seeing a software package do wall, floor, frame and connection designs in Revit. With BIM modelers like Revit, ArchiCAD and Bentley Architecture taking over as main planning tools, it is just consequent to move wood design into these platforms as well.